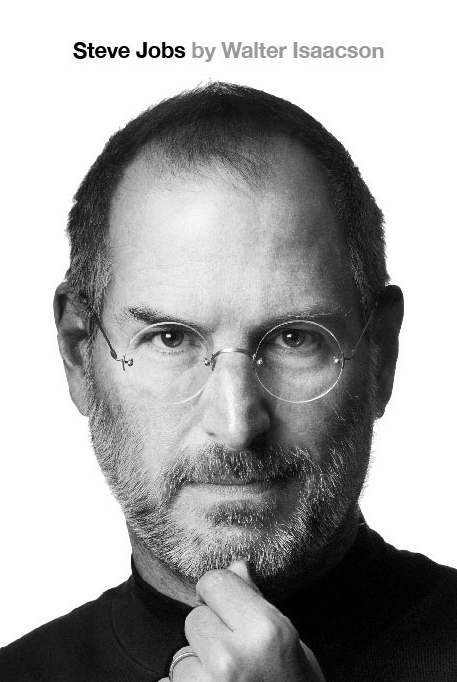 I just finished reading Walter Isaacson’s biography of Steve Jobs. Whether you’re a fan of Apple products or not, I recommend picking it up. For me, it was one of those books that I thought about reading even when I wasn’t reading it — I just couldn’t put it down. Being that I’m fairly late to the game on this book, this isn’t going to be a review. I would, however, like to bring up one of the more interesting questions posed by both this book and Job’s life itself. No, I’m not referring to the open vs. closed ecosystem argument which is often discussed in tandem with Steve Jobs; rather, I’d like to explore aesthetic taste and whether it is inherent or learned. Not surprisingly, I’ve put a lot of thought into this question throughout my life — that’s not to say that I’ve got some-kind of exemplary taste, I just tend to waste ample amounts of brain power on marginally meaningless subjects. It would be so much easier if I could believe that nature and nurture were equally essential to the development of aesthetic tastes; but alas, that’s not who I am. When I truly think about it, I always land in the camp that aesthetic tastes are universal and therefore, can be taught. There are aesthetic rules that govern the universe and, although they allow for some wiggle room, there is right and wrong when it comes to taste. The downside of having this opinion is that it means I also believe that someone can be wrong (philosophically, not morally) in their choices of what is aesthetically pleasing. Admittedly, I am just as often wrong as anybody else, but it’s offensive to some that I believe opinions can be wrong. My argument for this is actually quite simple. As one becomes mored educated on a subject, artistic or otherwise, they come to understand the underlying principles of that discipline, and their tastes change in reflection of that knowledge. If you accept this to be true, which I do, then you must also accept that their tastes, prior to being educated, where wrong in comparison to their new, inspired tastes. This means that poor taste is simply an indication of ignorance in a particular subject and can therefor be rectified by an education of the governing rules of that discipline. These rules apply to everything: films, music, photography, paintings, sculptures, industrial design, clothing, literature, food, etc. Some of these rules are known and written in stone — i.e. musical notes that combine to make chords. Others aren’t so hard and fast, giving artists much needed wiggle room. Still, I believe there are aesthetic rules man hasn’t even begun to understand. Much like scientists studying physics to unlock the mysteries of how our world works, artists search for new ways for us to contemplate the beauty of that very same world. I don’t believe Steve Jobs stumbled upon any of these unknown aesthetic rules, he simple spent his life reminding us of the most important one: less is always more. It’s that universally retrospective time of year again; the dead space between Christmas and New Years when one can’t help but look back on the last ±365 days and wonder where they disappeared to. I don’t know if there is an actual term for this strange week of limbo, but I like to call it “Top 10 Week” because all means of communication (radio, television, and the internet) are jammed with lists of the best, and worst, of anything able to be categorized. Last year, rather than creating a complete list, I started a tradition on this blog of simply sharing my favorite product of the year. In 2010 this happened to be a personal hygiene product but this year’s aligns with both my love for writing and technology. ALthough iA’s Writer was released in 2010, I didn’t get an iPad until this last summer. I knew that I would be doing a lot of word processing with it so Writer was one of the first apps I purchased. I had read about its great minimalist design and how it was supposed to remove all distractions and help one gain zen-like focus on the thoughts they were transferring to the screen and just had to try it out. I was not disappointed! This app is really amazing. Every detail of it is completely thought out. They haven’t simply taken away features to gain the minimalist moniker but rather enhanced features that help users focus on creating literary content. Once your thoughts are on paper, you can add design elements in an application that’s actually meant for designing, like Apple’s Pages app or Adobe InDesign (definitely not MS Word). My favorite feature of iA Writer for iPad is “focus mode,” which highlights only the sentence currently being worked on. Focus mode on the iPad (notice the top line of special characters that iA added for a much nicer typing experience). Writing on the iPad is good fun and all; but, the small keyboard can sometimes be annoying. This is especially true for longer documents. 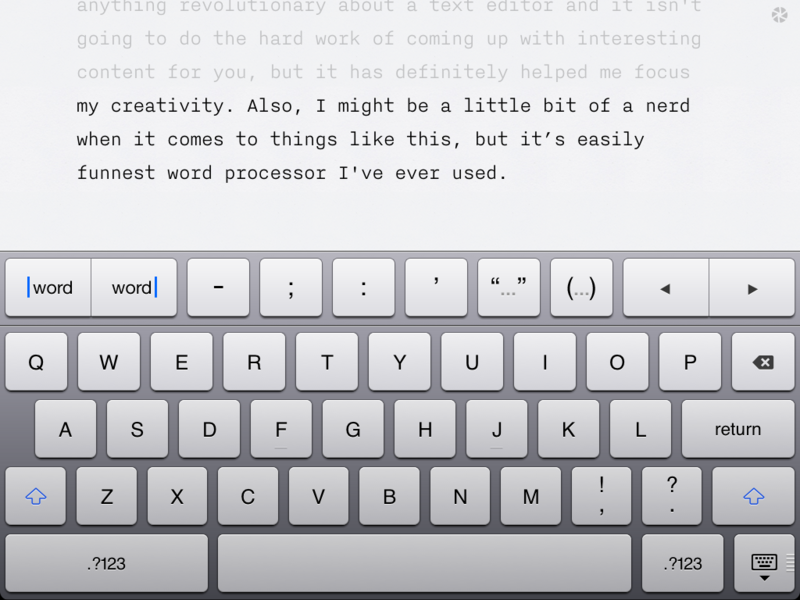 Thankfully iA released a Mac version of Writer earlier this year. Initially I had my doubts. While its features, like focus mode, made sense on the small iPad screen, I wasn’t sure if I would find them useful on a 27″ iMac screen. I’ve always used TextEdit and didn’t have a completely compelling reason to switch. However, I like Writer so much on the iPad that I thought I should give the Mac app a chance. I’m glad I did. Since downloading it I haven’t opened TextEdit once. Thanks to DropBox and iCloud integration, my documents are easily accessible on any of my devices. Writer looks just as beautiful, if not more so, on the desktop screen. My favorite feature of the Mac version is “full screen mode,” which fills the entire screen with one perfectly sized column for text in the center. In conjunction with “focus mode” I get completely immersed in my writing projects and distractions seem to simply evaporate away. Full screen and focus mode in Mac app. 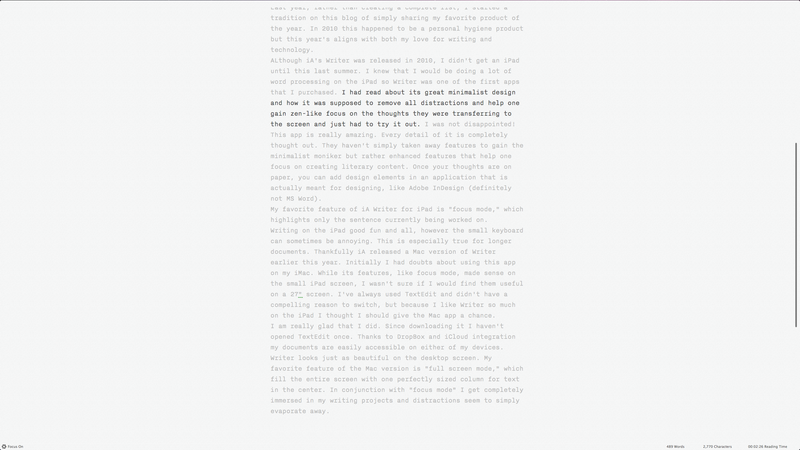 If you enjoy writing and/or have trouble overcoming distractions (the two seem to go hand-in-hand) you have simply got to give iA Writer a try. Yes, there isn’t anything revolutionary about a text editor and it isn’t going to do the hard work of coming up with interesting content for you, but it has definitely helped me focus my creativity. Also, I might be a little bit of a nerd when it comes to things like this, because I think Writer is the funnest app I have ever used — take that Angry Birds! I am not shocked that I enjoyed The Ides of March. I’m fairly cynical when it comes to politics, making political thrillers my bread and butter simply because they affirm my jaded opinions of politicians on either side if the party-line. That doesn’t mean this is favorite genre of film, mind you. It just makes it easier for movies in this category to please me. However, The Ides of March did exceed my expectations on two levels. I was pleasantly surprised at how apolitical it was and how restrained Clooney was as a director. Going into the theater, I knew I would at least be entertained but I feared that George Clooney’s smug might be present, and that pushing real world political agendas might be the motivation for the entire film. This is always a disappointment because it is usually done at the sacrifice of good storytelling. Thankfully, Clooney kept this political thriller fairly apolitical. This sounds like an oxymoron, but it’s not. By planting the characters squarely in the Democratic Party and basing the story in the Presidential Primary Race, The Ides of March avoids the “Liberals vs. Conservatives” trap, allowing the audience to grapple with its classic morals vs. means conundrum. My second surprise came from just how restrained Clooney’s directorial style was. I don’t really know why, but I was expecting this film to be an exercise in “slick” directing — constantly moving cameras from interesting angles with bold and intense music throughout. Which works well if you are Chris Nolan or David Fincher, but I tire of the second-hand directorial style of recent mediocre thrillers. Clooney successfully avoids a second common pitfall; using overly stylized direction to cover a lack of story or the lack of ability to tell a good story. His minimalist direction, coupled with a great musical score, allows the audience to be all the more drawn into the drama of the film which perfectly frames a classic philosophical question: Do the means justify the ends? What makes this particular story compelling is that the means depicted within are completely realistic and an everyday part of modern politics. Aside from these two pleasant surprises, my favorite part of this movie was its ending. It actually ends at the completion of the story arc! What an amazing concept. I loved the abrupt ending because I was expecting the usual five or ten minutes of wind-down thrown as explanation for the few dolts in the theater. Really though, ending at the proper point gives the audience the ability to better interpret things for themselves and leaves people wanting a bit more. This film reminded me of another Clooney film, Michael Clayton, in that it has expert pacing and doesn’t assume its audience is stupid. I feel that The Ides of March easily rises above most, if not all, of this years previous films. It is precisely directed and acted, with extremely compelling characters. I highly recommend it. Although I can see how some might feel as Fogs’ Movie Reviews, that our current political atmosphere makes this film’s extreme realism just a little hard to stomach.